A pioneering history based on an exhibition “Life in the Gorge,” displayed at Otaki Museum (30April–30 July 2011). Journeying up Otaki Gorge is not for the faint-hearted. The road follows Otaki River, from the Horowhenua township of Otaki, towards the river’s source in the rugged Tararua Ranges. The last 5km is unsealed, narrow and winding, with plunging drops to steel-grey river waters on one side, and steep, forbidding cliffs, often wrapped in cold wisps of white mist on the other. 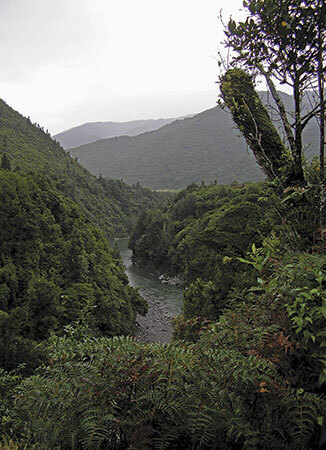 The Tararua Ranges are a giant, tilted fault block, heavily fractured by fault-lines — the Otaki and Akatarawa, which cut through Otaki Forks, and a third which crosses Otaki River, near the outer edges of the Ranges and their more recent foothills. The rivers, for most of their courses, followed these natural lines of weakness. In pre-habitation days the Gorge started on coastal plains, at the mouth of Otaki River, and the land was covered in heavy bush – totara, rimu and miro. Discovered artefacts have provided evidence of Maori exploration and habitation — rock adzes, a sperm whale tooth, a flint knife and a water trough, once used to attract wood pigeons to snares. Local tribes had great respect for the Tararua Ranges. Not only were they a route to and from the Wairarapa, and a place where their people derived water and food, but the mountains were regarded as a place of spiritual power, and a sanctuary from enemies. The entire Otaki Gorge area appears a microcosm of New Zealand’s pioneering past. It reflects the major stages of settlement in our country — a mixture of opportunities, challenges and defeat, prosperity and hardship. Between 1863 and 1881, surveyors played a crucial role in laying the foundations for the Gorge’s emerging settler society. The country was gripped by gold fever during these early years. Scottish-born James Coutts Crawford was appointed Provincial Geologist in 1861, and was the first European to explore Otaki Gorge and the Tararaua Ranges, in the hope of striking gold. On his first attempt, in the late summer of 1863, he was defeated by cold, powerful rivers and dense bush. Remaining convinced that gold could be found at Otaki Forks, he made a second attempt, but snow, cold, and lack of provisions forced a return. 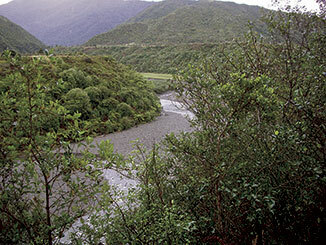 No trace of gold has been found in Otaki River or its surrounds. From 1887 to 1889 the Wellington and Manawatu Railway Company Limited advertised blocks of land for sale, as far afield as Australia and England. Many bought sight unseen, and as land was cleared, the Otaki Gorge became part of the country’s timber milling explosion– several mills were established, with logging of miro, totara, rimu, and other merchantable podocarps. However, the story of milling in the Gorge is one of hardship, ingenuity and expense (in transporting raw material to mills), and virtually all ventures struggled to make it a financial success. But the harshness of the terrain, and the unstable access on narrow, winding roads, was seen as a challenge by some, and with a mixture of technical ingenuity, financial and physical risk, and plenty of enthusiasm, a timber industry of sorts emerged in the Gorge. Today little remains of the Gorge mills, although hills reveal traces of rail tracks, some now serving as tramping tracks. The best logging relics are found in the vicinity of Otaki Forks and remnants are also displayed at Maymorn Estate, where a steam boiler, Vulcan steam hauler and engine have been cleaned and restored by the Forest Service, Department of Conservation staff and local volunteers. As land was laid bare in the lower reaches of the Gorge, blocks of land advertised as “great farming country” were taken up by settlers. Some attempted sheep farming on the hills, and small dairy enterprises emerged on the meagre flats. Four Gorge communities evolved, each separated by streams, precipitous bluffs and ridge systems, but connected by primitive roads, bridges and flying foxes. Waihoanga was initially settled by dairy farmers, but later, when a bridge was constructed in 1907, two timber mills were established. 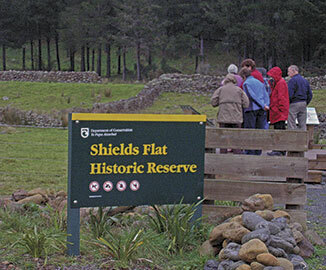 Shields Flat is a large terrace on the south side of Otaki River. It is dotted with long, stone walls and a series of stone pig pens, built by relief workers during the 1930s Depression. It’s also home to the unforgettable Blue Bluff, an extremely precipitous area which creates a division between settlements at the top end of the Gorge and the Flat. From a terrace at Otaki Forks you can look down at the picturesque Gorge head. Here the river flats are dissected by the Waitatapia and Waiotauru waters as they converge with Otaki River. A view across to the main Range can also be seen from here, where a school house, post office, and orphanage operated until destroyed by fire in 1947. “Although sheep were farmed by several families, the area hasn’t been grazed since 1997 — it’s in an advanced stage of regeneration,” says Barry Maunsell, whose name, like that of the Arcus family, is synonymous with the history of Otaki Gorge. The Arcus family settled at School Flat, the fourth and farthest community, and theirs is “a story of endurance, hardship, determination and reward.” The family fortunes improved when the Crown purchased their land, with a lease back arrangement, and they moved towards the mouth of the Gorge in the early 1970s, occupying several different farms and homesteads. The reality of the Gorge, with its harsh environment — the steep terrain, cold and rain — the quality of land, and the economics of farming have dictated what is happening today — regeneration, lifestyle blocks and recreational use. Eventually the promise of a vibrant set of villages set in the magnificence of the river, the flats and the hillsides faded into history. The reality of the Gorge, with its harsh environment — the steep terrain, cold and rain — the quality of land, and the economics of farming have dictated what is happening today — regeneration, lifestyle blocks and recreational use. Today Otaki Gorge is valued for its peace and quiet. A few small cottages nestle high in the dark hills, a scattering of upmarket homes gaze seawards. Picnic-goers fossick for blackberries, trampers, walkers, hunters and campers seek out forgotten tram tracks, while others pursue more watery pastimes such as rafting, canoeing and fishing.